Life for Leaders is written for people who exercise leadership in various sectors of life. Usually, we focus on ways in which biblical teaching is relevant for the work of leaders. Thus, you may be wondering why I am focusing on something as personal as sexuality. I would answer this query, first of all, by explaining that I always try to let the text of Scripture govern the content of my devotional writing. But, second, I believe that it’s helpful for us to remember that the work of our lives doesn’t have only to do with what we generally label as “work.” In fact, according to Genesis 1, being fruitful in the literal sense, that is, making more people to fill the earth, is a central facet of human work. Why is it important to remember this? Because many of us, especially those entrusted with positions of leadership, can easily neglect the family dimension of fruitfulness. We can get so busy in our professional work that we have little left to invest in fruitfulness at home, not only making babies, but also raising them to become fruitful adults and faithful disciples of Jesus. Let me offer a personal example. There have been times in my life when I’ve wondered if I have failed to accomplish what God intended for me in my professional life. I have worried that I have not lived up to my potential. I judge myself for not having written more books, preached better sermons, or led more influential institutions. But, upon reflection, I realize that one of the reasons I have been less productive in my “work” is that I have invested much of my life in the last twenty years in my “fruit,” that is, in my children. I have spent countless hours with them, taking them to the park, reading “chapter books,” advising them with school projects, or just hanging out. Parenting is not incidental to my primary purpose in life. It isn’t in conflict with my work; rather, it is part of my work. Family life is essential to the measure of my fruitfulness in life. If you are a parent and someone with a demanding professional life, how do you think about your work in relationship to your family? To what extent do you see fruitfulness in parenting as an essential part of what God has entrusted to you? Gracious God, thank you for allowing us to be fruitful in life. Thank you for creating us so that we might contribute to the goodness of this world. Thank you for giving to humankind the opportunity and responsibility of raising children so that they might become fruitful in their lives as well. Today I pray for parents, that you would grant them wisdom, energy, and love. Help those who are balancing work inside and outside of the home. As the community of the faithful, may we share together in the central task of discipling our younger members so they might live fully and fruitfully for you. Amen. 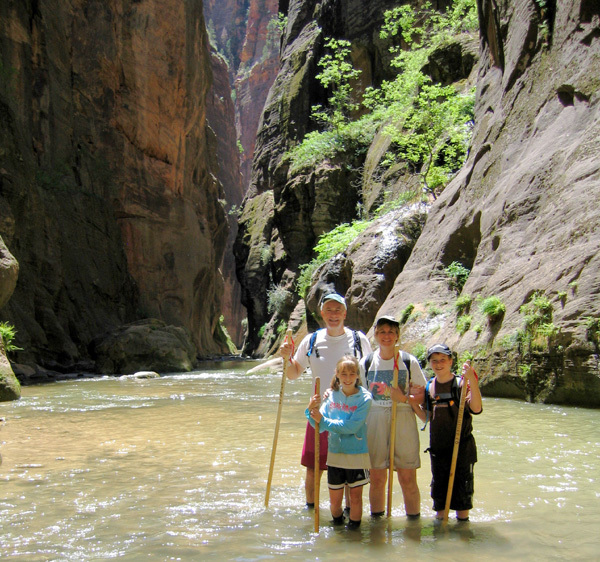 Photo of the Robertses hiking the Narrows in Zion Canyon; thanks to Mark Roberts for sharing!